SENATOR HECT RICHARD STONE; NATHAN PRITCHER, ARRANGEMENTS CHMN. Melvin H. Bacr and Jules B.
mat Country Club Sunday, Jan.
Bonds dinner-dance is Louis E.
Baer also announced that Mrs.
Town, Union of South Africa. was Uie Agi ncy"s Liaison ! he can not say how many. pleted in two years, Peres said.
) Commander-in-Chief and give him your opinions, whether pro or con." University law students on Oct. 10. I going to continue as the Chairman of the Joint Chiefs of Staff." ' service through his part in initiating this unfortunate controversy. which he has been and continues to be so deeply dedicated. , his regret for his comments at Duke University." all considered-and certainly do not represent my convictions. in this nation the privilege of expressing their views forcefully. American Jewish Community and Israel are somehow the same. 1 have just reiterated to the Jewish War Veterans. ganization to state Israel's case. mission of Israel to the UN. The officers include David I. Price, sice president; Mrs. A.
Robert Mills and Harry Powell. ida's newly elected U.S. Senator. Richard B. Stone, Sunday, Jan.
19, at the Fontainebleau Hotel. es share a common concern. East, Mr. Eban's publicatioi.. .-". YOU CAN REQUEST YOUR OWN TOWING SERVICE. a m. till 4:30 p.m. Thursday, Jan.
9, in Nova University Auditorium. will also give a musical program. al Council of Jewish Women, Mrs.
participant in Bonds for Israel. Jan. 22, at 7:30 p.m.
Perry as coordinator. Sam Perry. meeting at 8 p.m. Monday, Jan.
experts TO SUIT FLORIDIAN TASTE!! Direct at Wholesale Prices to You. 520 S. DIXIE HWY. HIWD. ballroom, 1400 N. 46th Avenue. for diaspora Jewish leaders engineering the exodus. around the possibility of emigration to their countries. beast we saved from utter destruction in World War II. want to find freedom in their bosoms. to Cuba, for example, without end. lesson we had learned in the Nazi era. lightenment somehow manages to flicker and burn out. the Persian Gulf to break the back of the embargo. hing so firmly or even intelligently. Well, now there is the demand signed by 71 U.S.
Is Alsop right in the end? Pecond-eiass Pnstaae Paid at Miami. 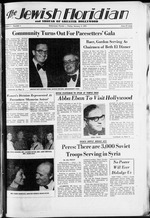 Fla.
Tha Jewish Florfdian hss absorbed tha Jewish Unity and tha Jewish Weekly. tary balance with eager delight. ing poorer as well as weaker. easy by that U.S. surplus. nificent recovery with our help. one must pray they are right. term deposits to be withdrawn. posits to slop coming in. feet to pay the monthly bills. months at about 70 per cent. To Finance World Aid Programs! migrants in Italy and Austria. The sources 3aid that an i"
ticipate in the seminar for American Jewish educators. Korfman and Baal Shem Tov. Israel Looks At The Future." departure from Israel Jan. 6.
y and South America. 10 days, 5 ports. Starting Nov. 19.
m+ St. Vincent, Martinique, St. Thomas. <* Dec. 20, Feb. 10,21, March 3: $735 to $1375. - Dec. 30, Jan. 10,20,31, March 14,24: $690 to $1280. You may never want to gel off. Jewi*a Federation, reminded the ments chairman lor the evening. DRS. PECK and GLAZER, P.A. 2500 E. HALLANDALE BCH. BLVD. prize opportunity to car readers. Israel plus 40 ether fine prizes. be post-marked by Feb 28, 1975.
begins at 7:30 and dinner at 8:30.
asked to bring their own lunch. each pav 50% of rate. 423 W. HAUANDAIE BEACH BIVD. Iron iKo Irouma ot butflory????? According to Dr. Samuel Z. "The Two Faces of the Angel." on the Institute campus was Dr.
a "perked coffee" May vin. by the cup or the potful. MAXIM." The May vin's favorite for fine coffee flavor. Mt. Moriah for the sacrifice? Naar is translated as "lad." young enough to be docile." Akedah as a test of Abraham. at the last moment by an angel. Abraham dwelt in Beer Sheba. in Hebron at the age of 127.
include Faye Plum, Melvia Toll. be audience participation in a.
of the Sabra Group, or Mrs.
current legislation within 60 days. cided whether to apply for exit. to, or hear from any foreigner. this applies directly to them. Please snd me literature on the above. 133BS W. DIXIE HIVV.. N.M.
Payne Lodge in New Rochelle. lity Dr. Rabbi Max Weltz. poaite Ho.lywood Hllla High School. Jaffe. Aaaiatant Rabbi Harvey M.
Johnaon St. Rabbi David Shanlro. Aaaociate Rabbi Chaim 8. Liatfield. tive) Pinea Middle School. 200 No. day, Jan. 14, at 1:00 p.m.
pont Plaza Hotel in Miami. Tailor in "Fiddler on the Roof"
The Publicity chairman is Mrs.
retaries are: Beach Group, Mrs.
Mrs. Esther Weiss and Mrs.
Mrs. Marvin Wolf; Sabra, Mrs.
Lisa, daughter of Mr. and Mrs.
Bruce, son of Mr. and Mrs.
JACOH. SO. of S4.-.4 Braes Valley. Professionals IIHouse PartyMiami BeachS p.m.
Home of Sophie Golub11:30 a.m.
Young ProfessionalsHouse PartyMiami Beach8 p.m.
Israel Bond Dinner Diplomat Hotel6:30 p.m.
ing, Americana Room, Hollywood- 8 p.m.
through State of Israel Bonds. vide a program of folk humor. hold a joint event Tuesday, Jan.
ke NCJW 2nd Summit Conference. points of the Jewish triangle,"
cial programs to be undertaken. held from 8:30 to 4:00 p.m.
in the event of any crisis. entation at the United Nations. achieve the 1975 goal of $300,000. Two Promoted By J. B. Hanauer Co.
Maryland. He joined the Hanauer. be repeated at Temple Solel Jan.
"Where Were You in 1939?" AND MRS. JANET BERT MAN. Jan. 8, at 9 p.m.
of resistance and defense . tion campaign, a coffee will be held in the home of Mrs.
Lucille Baer, (second from left) chairman of the Parker Plaza. Rabbi Robert Frazin, spiritual leader of Temple Solel, Mrs.
A special "wine and cheese"
Hal pern, Milton Fine. David G.